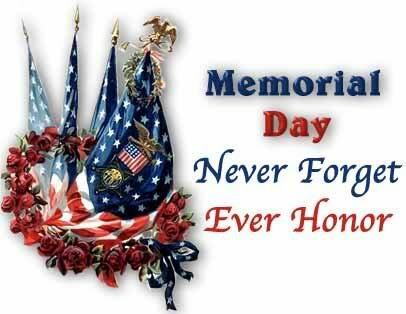 Please set it aside in reverence for all those who have served with honor and are now departed. And please join us for a moment of silence at 1500 hours your local time, for remembrance and prayer. Tags: ARRA News Service, veterans, Remembering, Memorial Day, 2010 Hat tip ARRA News Service. Posted by Bill Smith : Post Link --> 11:00 AM 0 Comments - Share Yours! "I shouldn't have to trade my constitutional rights for a paycheck." Tags: Tea Party, Tea Party Firing, Jacksonville, Florida, Live Oak, Republican Party, Democrat Party, politics, Fox News, Sarah Palin, Action News, Jax, George Bush, Chris Christie, Barack Obama, Tea party Bias, Media Bias, Lawsuit, KrisAnne Hall, Skip Jarvis, Free Speech, First Amendment To share or post to your site, click on "Post Link". Please mention / link to America's Best Choice. Thanks! Posted by Bill Smith : Post Link --> 3:30 PM 0 Comments - Share Yours! 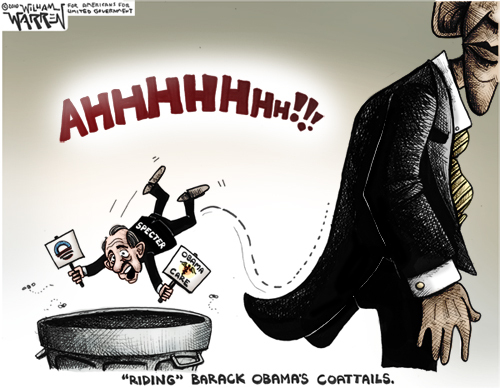 Tags: Arlen Specter, Barack Obama, ObamaCare, Political Cartoons, William Warren To share or post to your site, click on "Post Link". Please mention / link to America's Best Choice. Thanks! by Florida Pundit: The mainstream media was quick to describe primary election results in Pennsylvania, Kentucky and Arkansas as "anti-establishment" and hyped the victory of a Democrat in a special Congressional election to replace the Jack Murtha who died in February. Not so fast. Let's look at each of these races and see whether there is an overall trend. In Pennsylvania, Senator Arlen Specter lost the Democrat primary. Most Democrats had voted against Specter in five elections to the Senate when he was a Republican. When Specter switched parties last year, he explained that he became a Democrat so he could win reelection, not because he suddenly identified more with Democrat positions. Not surprisingly, Specter's cynical calculation had crossed a line and he was rejected as a calculating politician whose only concern is holding on to power. Specter voted for Obamacare and other bills on the Democrat's agenda since he switched parties and, as a Republican, had never been a reliable supporter of conservative positions. In Kentucky, Rand Paul, son of Republican presidential candidate Ron Paul, won against the candidate supported by Republicans like Senate Minority Leader Mitch McConnell. Rand Paul is a principled libertarian whose anti-government sentiments would not have won him elections before the age of Obama when most Americans where too complacent to support a candidate like Paul. Clearly, this was a vote against Obama's policies and Paul is in a strong position to win the Kentucky senate seat in November. In Arkansas, Democrat Blanche Lincoln failed to win 50 percent of the votes in the Democrat primary. She is likely to lose a primary runoff election next month. Arkansas is a conservative state and Lincoln's party-line vote for Obamacare, the stimulus and other Obama projects alienated moderate Democrats. This is another result indicating opposition to Obama's policies. In the Pennsylvania special election, Democrat Mark Critz defeated Republican nominee Tim Burns. Critz ran as a pro-life, pro-gun candidate and said he would have voted against Obamacare. The Democrat won because of his positions in opposition to the Obama administration. Higher turnout among Democrats because of the high profile Specter-Sestak senate primary may also have played a role in Critz' victory. The conclusion from these results is not that voters are blindly voting against incumbents. Instead they are voting, in the case of Specter and Lincoln against candidates who had supported Obama's policies, and, in the case of Rand Paul and Mark Critz, for two very different candidate who both oppose key items in the Obama agenda. In Pennsylvania Joe Sestak, a more leftist Democrat, will run against Republican Pat Toomey in November which makes a Republican victory more likely. The same is likely to happen in Arkansas. In Kentucky, the Republican establishment is quickly uniting behind Rand Paul. The mainstream media got it wrong again. Tuesday's election's dominant theme was a rejection of Obama's policies, not just an ideologically neutral vote against incumbents. Tags: Primary Elections, Kentucky, Pennsylvania, Arkansas To share or post to your site, click on "Post Link". Please mention / link to America's Best Choice. Thanks! Posted by Florida Pundit : Post Link --> 9:44 PM 0 Comments - Share Yours! Florida Pundit: A new Rasmussen poll has Republican Marco Rubio leading with 39 percent over Independent Charlie Crist (31 percent) and Democrat Kendrick Meek (18 percent). Crist left the Republican Party in late April after falling from a commanding lead last year to trailing Rubio by 30 points. It looks like Crist's slight bounce in a Mason Dixon poll from May 3-5 is over. Crist has become known for frequent flip-flops on issues like the Obama stimulus plan which he supported when it was passed. He left the Republican Party 30 days after he stated on national television that he was proud to be in the party of Abraham Lincoln, Teddy Roosevelt and Ronald Reagan. And he refused to return money to donors who had supported him as a Republican. Now Crist is saying that Elena Kagan will "do a great job" on the Supreme Court although last year he opposed the nomination of Sonia Sotomayor. Rubio is consolidating his lead among Republicans and is gaining among independent voters. 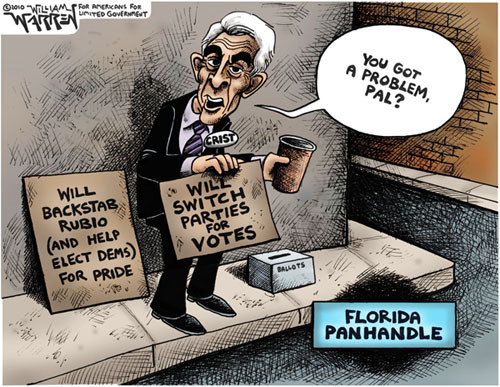 Given Crist's tendency to change his views based on what he thinks is best for him at the time, it seems unlikely that Crist can get enough Democrat votes to remain competitive even with a weak Democrat candidate. For the Rubio campaign this is certainly not the time to become complacent, but Marco Rubio is the candidate that clearly opposes the expansion of the federal government under Obama, the major issue that is likely to drive the outcome of the November 2010 election. Tags: Marco Rubio, Charlie Crist, Florida, U.S. Senate To share or post to your site, click on "Post Link". Please mention / link to America's Best Choice. Thanks! Posted by Florida Pundit : Post Link --> 9:17 PM 0 Comments - Share Yours! ARRA News Service - Update: In an interview, National Federation of Independent Business President Dann Danner said that NFIB with its 350,000 members will join the 20 States in the argument that Americans cannot be required under the Constitution to obtain insurance coverage. Georgia Governor's Office: Atlanta – Governor Sonny Perdue announced that Georgia has officially joined 19 other states in challenging the federal healthcare reform act when the amended complaint was filed today. The amended complaint now features 20 state plaintiffs and two individual plaintiffs; additionally, the National Federation of Independent Business (NFIB) joined the lawsuit as a co-plaintiff on behalf of its members nationwide. "Congress's healthcare bill will exact a huge cost on our state and curtail our economic growth," said Governor Sonny Perdue. "Congress has gone too far in infringing upon individuals' rights by imposing burdensome regulations on all Americans." The original lawsuit was filed against the U.S. Department of Health and Human Services, U.S. Department of Treasury and the U.S. Department of Labor on March 23, 2010, minutes after the health care reform act was signed into law by President Obama. Georgia is being represented by Frank C. Jones as Special Attorney General. Jones is joined by a team of other pro bono lawyers serving as deputy Special Attorneys General including: Mike Russ, retired Partner at King & Spalding; Jason Alloy and Josh Belinfante of RobbinsLaw LLC; Pitts Carr of Carr & Palmer; John Parker and Keith Blackwell of Parker, Hudson, Rainer & Dobbs LLP; and Mercer University law professor David Oedel. "Georgia's legal team has carefully considered our State's options for challenging the constitutionality of the federal healthcare reform legislation. We concluded that the Amended Complaint being filed today includes the strongest Constitutional arguments and, accordingly, that the interests of Georgia and its citizens are best served by joining in the Amended Complaint in the Florida action," said Frank C. Jones, Special Attorney General for the State of Georgia. The individual mandate directly affects NFIB and its members by requiring those individuals to obtain health care or pay a penalty, giving NFIB a distinct basis to represent its individual members and join the lawsuit. The seven states who formally joined the lawsuit today are Indiana, North Dakota, Mississippi, Nevada, Arizona, Georgia and Alaska. "Small business owners everywhere are rightfully concerned that the unconstitutional new mandates, countless rules and new taxes in the health care law will devastate their business and their ability to create jobs. They are also concerned about their personal freedoms," said Dan Danner, president and CEO of the National Federation of Independent Business. "This law is the first time the federal government has required individuals to purchase something simply because they are alive. If Congress can regulate this type of inactivity, then there are essentially no limits to what they can mandate individuals to do." The lawsuit, filed in federal court in the Northern District of Florida on March 23, alleges that the new law infringes upon the constitutional rights of Floridians and residents of the other states by mandating all citizens and legal residents have qualifying health care coverage or pay a tax penalty. By imposing such a mandate, the law exceeds the powers of the United States under Article I of the Constitution. Additionally, the tax penalty required under the law constitutes an unlawful direct tax in violation of Article I, sections 2 and 9 of the Constitution. The lawsuit further claims the health care reform law infringes on the sovereignty of the states and Tenth Amendment to the Constitution by imposing onerous new operating rules that Georgia and the other states must follow as well as requiring the state to spend additional dollars without providing funds or resources to meet the state's cost of implementing the law. Online copy of the lawsuit. Tags: States, lawsuit, ObamaCare, Federal health care, big government, infringement on individual rights, Georgia, sovereignty, 10th Amendment, mandatory health care insurance, tax pentalty To share or post to your site, click on "Post Link". Please mention / link to America's Best Choice. Thanks! Posted by Bill Smith : Post Link --> 7:35 PM 0 Comments - Share Yours! Update*: Jason Sager, District 5 was omitted from the referenced source article. After receiving a comment to this article, we confirmed that Sager qualified to be on the ballot the hard way - he secured 6,200 signatures from voters. Remember the First Vote a Newly Elected Democrat Makes is to Vote For Nancy Pelois to be Speaker of the House. Tags: Florida, Congressional District, Republican, candidates To share or post to your site, click on "Post Link". Please mention / link to America's Best Choice. Thanks! Posted by Bill Smith : Post Link --> 3:20 PM 4 Comments - Share Yours! Tags: Americans for Prosperity, AFP, Net Neutrality, No Internet Takeover, FCC, new rules, regulation H/T ARRA News Service. To share or post to your site, click on "Post Link". Please mention / link to America's Best Choice. Thanks! Posted by Bill Smith : Post Link --> 9:15 AM 0 Comments - Share Yours! ARRA News Service. - This week, Dr. Bill Smith, an America's Best Choice author and editor of both the ARRA News Service and Blogs For Borders was the featured guest of Silvio Canto, Jr.'s on his Dallas based "Let's Talk" Internet Radio Show. The topic was "Let's talk about the Arizona law." Of special interest in the conversational mix between Canto and Smith was the fact that Canto and his parents immigrated legally to the United States from Cuba and that Smith and his family had lived in Belgium and the Philippines subject to the laws of those countries. The show focused on border violence, the Arizona Law, the economic issues related to illegal aliens and rising crime, the need for a sane immigration policy, and the failure of the Federal Government to deal with securing the borders and protecting Arizona and other states. The show is archived and can be listened to at Let's talk about the Arizona law. You can even leave comments about Canto's "Let's Talk" shows. Posted by Bill Smith : Post Link --> 2:11 PM 0 Comments - Share Yours! by Rep. Eric Cantor (R-VA), Republican Whip: We all know that Washington has a spending problem – and both Democrats AND Republicans bear some responsibility. But as I wrote last week, America is at a crossroads and the choices we make at this critical time will determine what kind of country we want to be. To get back on the right path, Congress MUST start to make some choices that simply can’t be delayed any longer. We are launching YouCut – a first-of-its-kind project designed to defeat the permissive culture of runaway spending in Congress. It allows YOU to vote, both online and on your cell phone, on spending cuts that you want to see the House – YOUR HOUSE – enact. That’s right, instead of Washington telling YOU how THEY will spend YOUR money, YOU can tell THEM how to save it. After several days of voting, on Monday, May 17th, we will announce the first winner and later that week House Republicans will call for an up-or-down vote on the spending cut. We will repeat this cycle every week for the rest of the year. You have a right to a federal government that doesn’t spend money that it does not have. Anyone who believes that President Obama, Senator Reid, Speaker Pelosi or the Democratic majorities are “concerned” about the deficit should take a look at how grossly they’ve increased spending. 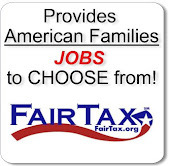 Make no mistake, they look at America’s massive debt and see a reason to raise taxes. But they are wrong. Our debt was born out of an addiction to spending. And if those same Democrats aren’t going to do anything to stop this addiction, we are. If those Democrats aren’t going to listen to you, we are. The time has come for Congress to finally show political courage. American families have been forced to face tough financial realities and make difficult but necessary decisions. Why should their government act any differently? This is not the same GOP as it was a few years ago, and with YouCut, we hope to force the Democrat-controlled Congress to begin to confront the difficult but unavoidable realities of our fiscal situation. Tags: YouCut, initiative, cut wasteful spending, Eric Cantor, Republican Whip, US House, vote to cut costs H/T ARRA News Service. To share or post to your site, click on "Post Link". Please mention / link to America's Best Choice. Thanks! Despite repeatedly voicing concerns about Arizona's new immigration enforcement law in recent weeks and threatening to challenge it, Attorney General Eric Holder testified today that he has not yet read the law. Congressman Poe pointed out that the bill was only 10 pages and offered Holder his copy of the bill to read. AG Holder appears to be playing to some kind of Obama agenda verses doing his duties as Attorney General. He has delayed the trials of terrorists, he has defamed Arizona actions to help protect themselves and and their financial interests without even reading the bill, and seems to be constantly boxed into a corner on issues by the administration. Tags: Congressional hearing, Eric Holder, AG, Attorney General, Ted Poe, Arizona, immigration law, illegal aliens To share or post to your site, click on "Post Link". Please mention / link to America's Best Choice. Thanks! Posted by Bill Smith : Post Link --> 5:56 PM 0 Comments - Share Yours! According to a May 5, 2010, Congressional Budget Office (CBO) report, under cap-and-tax legislation such as the House-passed H.R. 2454 or the Kerry-Lieberman Senate bill, “some people would lose health insurance coverage associated with their previous employer” after they lose their job due to the national energy tax. However, CBO notes that “the recently enacted health care legislation provide new opportunities for individuals to purchase health insurance” — meaning they will effectively be forced into government-run health care. The CBO report goes on to list other consequences of cap-and-tax legislation for families and communities. The report states that, “In cases in which a shrinking industry was the primary employer in a community, the entire community could suffer.” Possible effects on an affected community include, according to CBO: The erosion of a local tax base as employment and economic activity drops. -- Homes could decline in value as laid-off workers sell their homes and move away in search of employment opportunities elsewhere. -- People who lose their job tend to have more health problems later in life. -- Losing a job can causefamily life to suffer. The question remains: Given the negative effects a national energy tax would have on health care, the real estate market, local economies, and family life according to the nonpartisan CBO, will Democrats push to pass cap-and-tax this year? Additional info from Obama himself regarding electricity rates - see picture above. Tags: CBO, Congressional Budget office, Cap-and-Trade, ObamaCare H/T ARRA News Service. To share or post to your site, click on "Post Link". Please mention / link to America's Best Choice. Thanks! Posted by Bill Smith : Post Link --> 5:59 PM 0 Comments - Share Yours! We're bailing out Greece . . .
by Rep. Mike Pence and Rep. Cathy McMorris Rogers: US taxpayers will be helping to foot the bill for the Greek bailout, via the International Monetary Fund. And if the Obama administration doesn't draw a clear line, Uncle Sam may soon be on the line for even more and larger European "rescues." The Greek government, with its high taxes and profligate spending to support large bureaucracies and social programs, is bankrupt. Its bonds have been downgraded to junk status. As economist Milton Friedman once said, "If you put the federal government in charge of the Sahara Desert, in five years there'd be a shortage of sand." Greece has run out of sand. Concerned that the fiscal damage could spread throughout the EU and the world, other European Union members and the IMF have pledged $145 billion to bail out Greece. And since the United States is the largest contributor to the IMF budget, our government will be funneling billions of American tax dollars to Greece. No one wants to see Greece fail -- the economic stability of Europe is important. But US taxpayers have funded bailout after bailout, and our country faces a debt crisis of its own. Our unemployment rate stands at nearly 10 percent. The public debt now stands at $9.2 trillion. The Congressional Budget Office predicts that America's debt held by the public will reach 90 percent of gross domestic product within 10 years under President Obama's budget. Without dramatic spending restraints, America is on a path like the one that led to Greece's financial catastrophe. In fact, Federal Reserve Chairman Ben Bernanke recently warned congressional leaders that, without significant spending restraints, the United States would soon face a debt crisis like the one in Greece. It is unfair and unwise to ask US taxpayers to fund bailouts for EU countries while America racks up huge deficits. And it's unlikely that Greece will be the last major EU member to seek financial help. High-debt Portugal, Spain and Italy could all face similar crises soon. Piero Ghezzi, an economist at Barclay's Capital, estimates that Spain may need a $450 billion bailout. Italy might well need more. The United States pays 17 percent of total member contributions to the IMF; No. 2 Japan provides just 6 percent. That entitles us to a claim on the overall IMF balance sheet, not a share of any specific loan -- but it still means that our "share" of the $40 billion IMF package for Greece is equivalent to $6.8 billion. Last year, Congress passed another $100 billion line of credit to the IMF -- funds the IMF said will go "to forestall or cope with an impairment of the international monetary system or to deal with an exceptional situation that poses a threat to the stability of that system." In other words, the "too big to fail" doctrine is being expanded to an international level -- with the United States as the primary stakeholder. While a $145 billion bailout will temporarily dull Greece's pain, it's still not clear that Athens will carry out the necessary vast cuts in government spending; Greece and the EU may be setting themselves up for an even larger financial crisis down the road. The American people already know what the governments of Greece and other EU members must learn: A nation can't borrow, spend and bail out its way back to a growing economy. New Jersey faces a fiscal crisis, and Gov. Chris Christie is making tough choices without raising taxes or requesting aid from Washington, DC. If America isn't asking Europe for help with New Jersey, why should the EU ask the US for help with Greece? The IMF executive board is scheduled to meet tomorrow to approve the bailout funding. We are urging the administration to use its seat on the IMF board to call for a formal vote and to oppose this bailout. America can't unilaterally stop this loan request, but a "no" vote would send a clear message: Europe needs to put its own fiscal house in order with spending restrictions, entitlement reform and pro-growth economic policies -- instead of looking to the US taxpayer to foot the bill for one more government bailout. Rep. Mike Pence (Ind.) and Rep. Cathy McMorris Rodgers (Wash.) are the chairman and vice chair of the House Republican Conference. Tags: Mike Pence, Cathy McMorris Rogers, Greece, Europe, United States, IMF, bailout, US Taxpayers To share or post to your site, click on "Post Link". Please mention / link to America's Best Choice. Thanks! Posted by Bill Smith : Post Link --> 9:04 PM 0 Comments - Share Yours! Tags: health care, deficit, CBO, no savings, Cross Posted from the ARRA News Service. To share or post to your site, click on "Post Link". Please mention / link to America's Best Choice. Thanks! Posted by Bill Smith : Post Link --> 8:18 PM 0 Comments - Share Yours! Excerpts from Article by Michelle Malkin: America's homeland security amnesia never ceases to amaze. In the aftermath of the botched Times Square terror attack over the weekend, Pakistani-born bombing suspect Faisal Shahzad's U.S. citizenship status caused a bit of shock and awe. . . . wake up and smell the deadly deception. -- El Sayyid A. Nosair wed Karen Ann Mills Sweeney to avoid deportation for overstaying his visa. He acquired U.S. citizenship, allowing him to remain in the country, and was later convicted for conspiracy in the 1993 World Trade Center bombing that claimed six lives. -- Ali Mohamed became an American citizen after marrying a woman he met on a plane trip from Egypt to New York. Recently divorced, Linda Lee Sanchez wed Mohamed in Reno, Nev., after a six-week "courtship." Mohamed became a top aide to Osama bin Laden and was later convicted for his role in the 1998 United States embassy bombings in Africa that killed 12 Americans and more than 200 others. -- Embassy bombing plotter Khalid Abu al Dahab obtained citizenship after marrying three different American women. -- Embassy bombing plotter Wadih el Hage, Osama bin Laden's personal secretary, married April Ray in 1985 and became a naturalized citizen in 1989. Ray knew of her husband's employment with bin Laden, but like many of these women in bogus marriages, she pleaded ignorance about the nature of her husband's work. El Hage, she says, was a sweet man, and bin Laden "was a great boss." -- Lebanon-born Chawki Youssef Hammoud, convicted in a Hezbollah cigarette-smuggling operation based out of Charlotte, N.C., married American citizen Jessica Fortune for a green card to remain in the country. -- Hammoud's brother, Mohammed Hammoud, married three different American women. After arriving in the United States on a counterfeit visa, being ordered deported and filing an appeal, he wed Sabina Edwards to gain a green card. Federal immigration officials refused to award him legal status after this first marriage was deemed bogus in 1994. Undaunted, he married Jessica Wedel in May 1997 and, while still wed to her, paid Angela Tsioumas (already married to someone else, too) to marry him in Detroit. The Tsioumas union netted Mohammed Hammoud temporary legal residence to operate the terror cash scam. He was later convicted on 16 counts that included providing material support to Hezbollah. -- A total of eight Middle Eastern men who plotted to bomb New York landmarks in 1993 -- Fadil Abdelgani, Amir Abdelgani, Siddig Ibrahim Siddig Ali, Tarig Elhassan, Abdo Mohammed Haggag, Fares Khallafalla, Mohammed Saleh, and Matarawy Mohammed Said Saleh -- all obtained legal permanent residence by marrying American citizens. A year after the 9/11 terrorist attacks, homeland security officials cracked a massive illegal alien Middle Eastern marriage fraud ring in a sting dubbed "Operation Broken Vows" . . . which stretched from Boston to South Carolina to California. But marriage fraud remains a treacherous path of least resistance. The waiting period for U.S. citizenship is cut by more than half for marriage visa beneficiaries. Sham marriage monitoring by backlogged homeland security investigators is practically nonexistent.
. . . Jihadists have knowingly and deliberately exploited our lax immigration and entrance policies to secure the rights and benefits of American citizenship while they plot mass murder -- and we haven't done a thing to stop them. Tags: Jihadists, terrorists, sham marriages, visa, US, American, citizenship To share or post to your site, click on "Post Link". Please mention / link to America's Best Choice. Thanks! Posted by Bill Smith : Post Link --> 9:59 PM 0 Comments - Share Yours! ARRA News Service - Politico is reporting a story which illustrates just how corrupt and brazen some progressive politicians are. Senate majority leader Harry Reid (D-NV) is flexing his power as the Progressive Mafia Consigliere (under Progressive Mob Boss Obama). After threatening Wall Street with progressive socialist reform, Reid hits up Wall Street for contributions (payments) to his campaign. Consigliere Reid makes it clear that he will remember as he and his minions extends invitations to Wall Street firms. His suggestive message is clear - Pay me now or I will make you pay more later. Wall Street is being approached by more than one member of the Progressive Mafia, It is also being threatened by an Obama's lieutenant who threatens to "break up large Wall Street banks." Tags: Politico, Harry Reid, corruption, progressive, Mafia, progressive mafia, Consigliere, kickbacks, campaign, contributions To share or post to your site, click on "Post Link". Please mention / link to America's Best Choice. Thanks! Posted by Bill Smith : Post Link --> 10:13 PM 0 Comments - Share Yours! Posted by Bill Smith : Post Link --> 1:13 AM 0 Comments - Share Yours! Republican Senators:As businesses express their concerns about the Democrats' financial regulation bill, Republicans are working to make sure that any legislation passed by the Senate protects Main Street and ensures that small banks and small businesses will not be hit with burdensome new regulations. Tags: finance reform, regulation, Goldman Sachs, Wall Street, Main Street, Republican Senators, banks, derivatives, news, dentist, orthodontist, economy, politics, government, small business, jobs, Harley-Davidson, Snickers, beer, community banks, Richard Shelby, Orrin Hatch, Mitch McConnell, Lamar Alexander, Jim DeMint, Kit Bond, Pat Roberts, Jim Bunning, Saxby Chambliss, Kay Bailey Hutchison, Judd Gregg, MSNBC, Morning Joe, financial, GOP To share or post to your site, click on "Post Link". Please mention / link to the ARRA News Service. Thanks! Posted by Bill Smith : Post Link --> 1:33 AM 0 Comments - Share Yours!